Baldwin Supply would like to thank you for another wonderful year and wish you and your family a Happy Thanksgiving! After reflecting about what to write, I decided to go back to what I wrote last year at this time. Please take a moment to read The Impact of Conversation by Dave LaRue. 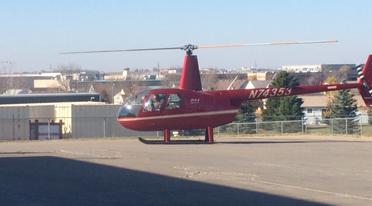 A customer picked up a motor at our Sioux Falls branch via helicopter! If you have a rush order please call in! Why BSC Independent Distribution Vs. Direct? As an independent distributor, Baldwin Supply stocks the parts and components to keep regional manufacturing running. In short, if you're a manufacturer in the Upper Midwest, Baldwin provides the products and solutions you need so that you can focus on what you do best. The Vikings stadium is now 80% complete.